In recent years, there has been an increased interest in the relationship between leadership style and employees’ motivation and performance (Domingues et al., 2017). The aim of this essay is to identify and evaluate the links between leadership styles and employee outcomes using traditional leadership and motivation frameworks. The leadership models providing the theoretical basis of the discussion are the classical model by Kurt Lewin (Billig, 2015), the Managerial Grid Model by Blake and Mouton (1964), and the transformational leadership model. The confirming and disconfirming empirical evidence for the relationships implied by each model is critically evaluated. All the leadership styles can be categorised as either authoritarian, participative or laissez-faire, as according to Kurt Lewin (Billig, 2015). The authoritarian leadership style is characterised by the highest degree of control of the leader and very limited followers’ input (Goleman, 2017). This leadership style can be very effective in increasing employees’ motivation and involvement if applied in appropriate conditions (i.e. crises, highly volatile and uncertain environments, teams lacking self-organisation or experience and military conflicts) (Billig, 2015). The authoritarian leadership style is better suited for the situations, where employees prioritise basic needs, as according to Maslow’s pyramid model (Niemela and Kim, 2014). The main positive effects of this strategy on followers’ performance involve faster decision-making and a greater focus on simpler tasks. However, this is likely to be accompanied by a decrease in creativity and morale, as well as a disconnect with management (Iqbal et al., 2015). Therefore, the autocratic leadership can be very effective in the short-term, while it is not well-suited for the long run (Iqbal et al., 2015). Another situation, where this style is appropriate, is if the Theory X is believed to be true, as the direct firm control tends to be the best response to the poorly motivated workforce (Lawter et al., 2015). The participative leadership style can enhance the performance and motivation of employees with actualised social and self-fulfillment needs, which form the top layers of Maslow’s model (Billig, 2015). The underlying assumption of this leadership style is that the involvement of followers in decision-making contributes to better quality of decisions because of the experience of direct interaction with customers that is possessed by frontline staff (Vance, 2016). However, the expectation of valuable insights from employees is not the only reason for participative leaders to consult with their followers. There is evidence that those working under participative leaders develop stronger commitment and put more effort into their job as they acquire the feeling of ‘job ownership’ (Lazaroiu, 2015). On the other hand, this evidence mainly comes from the contexts where Theory Y is applicable, e. g. the employees’ material and safety needs are already satisfied (Iqbal et al., 2015; Lawter et al., 2015). When this is not the case, participative leadership might be less effective than offering more substantial tangible rewards. One more criticism for the participative leadership style is that it is more demanding of the follower skill and qualifications than authoritarian leadership (Lawter et al., 2015). In other words, participative leadership is likely to be maximally productive for the teams that already combine high motivation with high professionalism. When employees lack motivation or skill, they are unlikely to contribute effectively to the decision-making process. For such teams, authoritarian leadership may be preferable (Goleman, 2017). 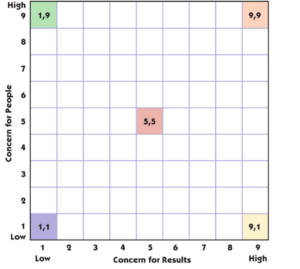 In contrast to the previously mentioned theories, which argue a situational approach, the Managerial Grid Model, which is based on the Theory Y, suggests that there is only one single best style of leadership for influencing employees’ involvement, motivation, and performance, namely the team style leadership (9.9 – Team Leadership in Figure 1) (Blake and Mouton, 1964; Lawter et al., 2015). It is argued that due to the maximisation of focus on both the employees and the production, productivity would be maximised, in contrast to the other styles within the framework (i.e. the country club style, middle-of-the-road style, impoverished style and produce or perish style). It has to be noted that both the Hersey-Blanchard Situational Leadership Theory and the Path-Goal Theory argue the exact opposite to the static approach of the Managerial Grid Model, that is leadership should dynamically adjust in response to external factors (Bates, 2016; Phillips and Phillips, 2016). The dynamic approach seems to be more realistic, especially given that companies tend to shake up their leadership from time to time. Transformational leadership is defined as the inspiration of followers, as opposed to transactional leadership that relies on punishments and rewards to elicit the desired behaviour (Jacobsen and Andersen, 2015). The impact of transformational leadership on employee performance and motivation has been widely researched, but the obtained findings are inconclusive. In particular, Asrar-ul-Haq et al. (2016) and Elqadri et al. (2015) observed a positive contribution of transformational leadership to employee performance across a variety of industries. The drawbacks of these studies include the self-assessment style of the surveys, which inevitably induces personal bias, and their geographic context. Specifically, Asrar-ul-Haq et al. (2016) argued that the Pakistani economy is under significant pressure, so therefore the results cannot be easily generalised to other countries. The model derived in their study could be used by the human resource (HR) management to facilitate transformational leadership practices and development programmes, design retention, and motivation schemes, as well as provide an insight on which leadership style should be applied (Asrar-ul-Haq et al., 2016). Interestingly, the findings of Asrar-ul-Haq et al. (2016) are directly contradicted by the more recent study of Domingues et al. (2017) who developed another leadership style model in the context of the link between salespersons’ goal orientation and performance. Domingues et al. (2017) utilised two separate surveys and multi-level hierarchical analysis. The study concluded that transformational leadership had a negative mediating effect on the relationship between performance and learning orientation and that the opposite is true for transactional leadership (Domingues et al., 2017). The main criticism of this study is its scale. It can be argued that the researchers evaluated a local phenomenon, not a general trend. The practical use of the paper is questionable, as the main insight of the study is that the topic requires more attention and research. Another study challenging the alleged superiority of transformational leadership style is Zareen’s et al. (2015) that found no significant difference between transformational, transactional, and laissez-faire style. All three of them increased employee motivation to a roughly equal extent (Zareen et al., 2015). Similarly to Asrar-ul-Haq et al. (2016) study, Zareen’s et al. (2015) investigation was set in the Pakistani financial industry. One possible reason that their findings were directly opposite is the different composition of participants. The employees contacted by Zareen et al. (2015) occupied overall higher positions and had longer tenures than those surveyed by Asrar-ul-Haq et al. (2016). Thus, the former employee group could have had a higher intrinsic motivation that was retained under leaders with any style. Meanwhile, the evidence of the positive impacts of transformational leadership is too substantial to be dismissed. In particular, transformational leadership was found to increase job motivation and creativity in a sample of 339 hospitality service employees (Chang and Teng, 2017). Other studies established greater work engagement (Liang et al., 2017) and reduced turnover intention (Gyensare et al., 2016) in the teams led by transformational leaders. These findings, obtained across a variety of industries, call for a closer investigation of which specific conditions make transformational leadership desirable and which favour transactional style. The majority of contemporary leadership theories share the point that a leadership style should be chosen according to the characteristics of followers and other situational demands. In particular, the authoritarian leadership style from Lewin’s classical model can work best for employees with actualised basic needs and those with considerable gaps in motivation and/or skill (Billig, 2015). For those with high motivation and professional level, the participative leadership style is preferable because it will help these employees feel valued and further increase their commitment (Lazaroiu, 2015). A similar division may exist between the transformational and transactional leadership style as the available empirical evidence of their comparative effectiveness is highly inconclusive. Some studies found an apparent superiority of transformational style in enhancing follower motivation and performance (Asrar-ul-Haq et al., 2016; Elqadri et al., 2015), while others indicated its inferiority (Domingues et al., 2017) or parity (Zareen et al., 2015) to transactional style. Further research is necessary to determine the reasons for which transformational leadership succeeds in some situations and fails in others, even within the same industry. The only theory that assumes the existence of a single ‘perfect’ leadership style is the Managerial Grid Model. However, this model does not have such strong empirical support as other theories discussed in its paper, so the relationships implied by the Managerial Grid should be taken with caution. Asrar-ul-Haq, M. and Kuchinke, K.P. (2016) “Impact of leadership styles on employees’ attitude towards their leader and performance: Empirical evidence from Pakistani banks”, Future Business Journal, 2 (1), pp. 54-64. Bates, C. (2016) “A methodology study of Hersey and Blanchard situational leadership theory”, International Journal of Advancement in Engineering Technology, 3 (11), pp. 42-48. Billig, M. (2015) “Kurt Lewin’s Leadership Studies and His Legacy to Social Psychology: Is There Nothing as Practical as a Good Theory?”, Journal for the Theory of Social Behaviour, 45 (4), pp. 440-460. Blake, R. and Mouton, J. (1964) The Managerial Grid: The Key to Leadership Excellence, Houston: Gulf Publishing Co.
Chang, J.-H. and Teng, C.-C. (2017) “Intrinsic or extrinsic motivations for hospitality employees’ creativity: the moderating role of organisation-level regulatory focus”, International Journal of Hospitality Management, 60 (1), pp. 133-141. Domingues, J., Vieira, V.A. and Agnihotri, R. (2017) “The interactive effects of goal orientation and leadership style on sales performance”, Marketing Letters, 28 (4), pp. 637-649. Elqadri, Z.M., Priyono, P., Suci, R.P. and Chandra, T. (2015) “Effect of Leadership Style, Motivation, and Giving Incentives on the Performance of Employees—PT. Kurnia Wijaya Various Industries”, International Education Studies, 8 (10), pp. 183-192. Goleman, D. (2017) Leadership That Gets Results (Harvard Business Review Classics), Boston: Harvard Business Press. Gyensare, M. A., Anku-Tsede, O., Sanda, M.-A. and Okpoti, C. A. (2016) “Transformational leadership and employee turnover intention: the mediating role of affective commitment”, World Journal of Entrepreneurship, Management and Sustainable Development, 12 (3), pp. 243-266. Iqbal, N., Haider, N. and Anwar, S. (2015) “Effect of Leadership Style on Employee Performance”, Arabian Journal of Business and Management Review, 5 (5), pp. 1-6. Jacobsen, C. B. and Andersen, L. B. (2015) “Is leadership in the eye of the beholder? A study of intended and perceived leadership practices and organisational performance”, Public Administration Review, 75 (6), pp. 829-841. Lawter, L., Kopelman, R.E. and Prottas, D.J. (2015) “McGregor’s Theory X/Y and Job Performance: A multilevel, multi-source analysis”, Journal of Managerial Issues, 27 (1-4), pp. 84-101. Lazaroiu, G. (2015) “Employee motivation and job performance”, Linguistic and Philosophical Investigations, 14 (1), pp. 97-102. Liang, T.-L., Chang, H.-F., Ko, M.-H. and Lin, C.-W. (2017) “Transformational leadership and employee voices in the hospitality industry”, International Journal of Contemporary Hospitality Management, 29 (1), pp. 374-392. Mosley, D., Mosley, D. and Pietri, P. (2010) Supervisory Management, 8th ed., London: Cengage Learning. Niemela, P. and Kim, S. (2014) “Maslow’s Hierarchy of Needs”, Encyclopedia of Quality of Life and Well-Being Research, pp. 3843-3846. Phillips, A.S. and Phillips, C.R. (2016) “Behavioral styles of path-goal theory: An exercise for developing leadership skills”, Management Teaching Review, 1 (3), pp. 148-154. Vance, D.L. (2016) “The relationship between participative leadership style and employee satisfaction with possible moderators of emotional stability (neuroticism) and years of experience”, Doctoral Thesis, Trevecca Nazarene University, Nashville, pp. 1-81. Zareen, M., Razzaq, K. and Mujtaba, B. (2015) “Impact of transactional, transformational and laissez-faire leadership styles on motivation: a quantitative study of banking employees in Pakistan”, Public Organisation Review, 15 (4), pp. 531-549.